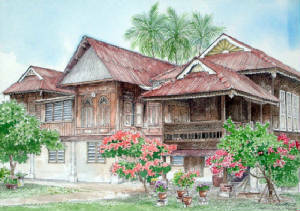 Chin KonYit is one of Malaysia's most eminent watercolour artists. 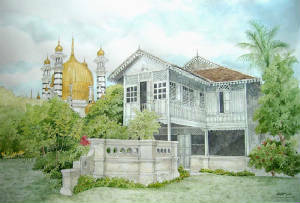 He is largely a self-taught artist. However, his talents in art and natural skills and determination won him a prominent position in a leading advertising agency, and he worked in this field for 15 years. In his spare time he pursued his own interests in fine art, painting street-life and architectural subjects in particular. In 1991 he became a full-time artist. 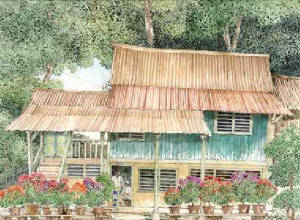 Kon Yit's work has been shown in ten solo exhibitiobs in Kuala Lumpur, numerous joint exhibitions both local and international, displayed in several hotels, and published in books, calenders, greeting cards and on stationery. The city's endless development of high rising skyscrapers, long meandering highways and the daily recurrence of massive traffic jams........ Perhaps these are the tell tale signs of prosperity. 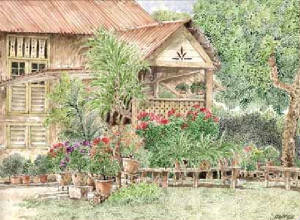 Away from the hustle and bustle of the city, the sight of the countryside is always certain to lift one's spirit; the greenery of the woods, the peace and tranquility of the surroundings, the distinct kampung houses, more often than not, I could not help myself but to feel a burning desire to immortalize these living precious moments of beauty in my paintings.